The Great Leap Forward (what Diamond calls the evolution from earlier versions of man to Cro-Magnons, the first fully modern humans) coincides with the first proven major extenion of human geographic range since our ancestors' colonization of Eurasia. That extension consisted of the occupation of Australia and New Guinea, joined at that time into a single continent. Many radiocarbon-dated sites attest to human presence in Autralia/New Guinea between 40,000 and 30,000 years ago (plus the inevitable somewhat older claims of contested validity). Within a short time of that initial peopling, humans had expanded over the whole continent and adapted to its diverse habitats, from the tropical rain forests and high mountains of New Guinea to the dry interior and wet southeastern corner of Australia. During the Ice Ages, so much of the oceans' water was locked up in glaciers that worldwide sea levels dropped hundreds of feet below their present stand. As a result, what are now the shallow seas between Asia and the Indonesian islands of Sumatra, Borneo, Java, and Bali became dry land. (So did other shallow straits, such as the Bering Strait and the English Channel.) The edge of the Southeast Asian mainland then lay 700 miles east of its present location. Nevertheless, central Indonesian islands between Bali and Australia remained surrounded and separated by deep-water channels. To reach Australia/New Guinea from the Asian mainland at that time still required crossing a minimum of eight channels, the broadest of which was at least 50 miles wide. Most of those channels divided islands visible from each other, but Australia itself was always invisible from even the nearest Indonesian islands, Timor and Tanimbar. Thus, the occupation of Australia/New Guinea is momentous in that it demanded watercraft and provides by far the earliest evidence of their use in history. Not until about 30,000 years later (13,000 years ago) is there strong evidence of watercraft anywhere else in the world, from the Mediterranean. Initially, archaeologists considered the possibility that the colonization of Australia/New Guinea was achieved accidentally by just a few people swept to sea while fishing on a raft near an Indonesian island. In an extreme scenario the first settlers are pictured as having consisted of a single pregnant young woman carrying a male fetus. But believers in the fluke-colonization theory have been surprised by recent discoveries that still other islands, lying to the east of New Guinea, were colonized soon after New Guinea itself, by around 35,000 years ago. Those islands were New Britain and New Ireland, in the Bismarck Archipelago, and Buka, in the Solomon Archipelago. Buka lies out of sight of the closest island to the west and could have been reached only by crossing a water gap of about 100 miles. Thus, early Australians and new Guineans were probably capable of intentionally traveling over water to visible islands, and were using watercraft sufficiently often that the colonization of even invisible distant island was repeatedly achieved unintentionally. Wow. 40,000 years ago! You go, boat people. 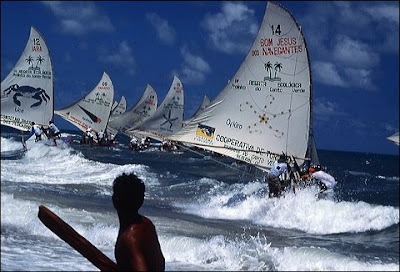 Paul Lima, president of a nonprofit organization called The Endangered Coast, has posted a comment on my earlier post concerning the Brazilian fishing rafts known as jangadas. He also provides the URL to a short documentary that he produced about the effect of recent tourism development on the jangada fishermen. (I couldn't access the soundtrack to the Quicktime version, but the Flash version works fine.) Many good photos of jangadas in the documentary, plus disturbing discussion of how tourism development does not necessarily benefit the lowest economic classes, in spite of its promoters' promises. Also look in the site's Image Bank, where there are other fine photos, including the one I've reproduced above. 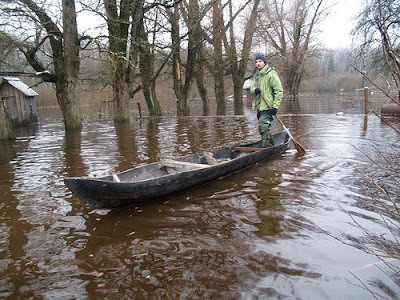 It's a surprise to find the persistence of the dugout canoe in Europe. 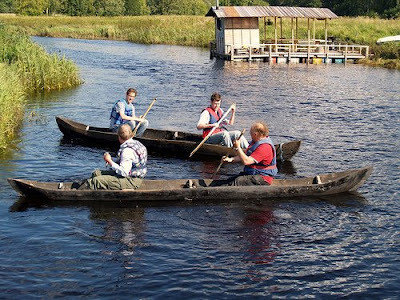 In Estonia's boggy, swampy Soomaa National Park, dugout canoe building is offered as a workshop. And it looks like a real bargain: a mere 250 Euros will buy you a 5-day program of instruction, accommodations, and meals. (Too steep? Save 50 Euros by bringing your own tent and sleeping bag.) Instruction is offered in Estonian, English, Finnish, Swedish, German, and Russian. The Estonian version is one of the sweetest looking dugouts I've seen. As shown in the photos, the log (oak?) is hollowed to a concavity significantly greater than 180 degrees, then softened with fire (not steam) and spread apart with numerous spreader sticks, after which some thwarts are installed. Stem protrusions are left in place, and I wonder if they extend beneath the hull to serve as a keel. While most tourists will no doubt paddle them from a sitting position in the bottom, poling or paddling from a standing position is an option. The photos are from Aivar Ruukel, a travel professional and dugout aficionado in Estonia who promotes the building courses and related trips. See his blog.